One of the best ways to prepare for a job interview is to review common questions you might be asked. By reviewing questions and answers relating to work at a call center, you will be ready to ace your interview. Try to personalize your answers with examples from your previous experience at work, school, and volunteer positions. Here are some answers to the call center job interview question "Do you have good people skills?" I like working with people, and I have been told that I have good people skills. My previous manager rated my communication skills at a 9 out of 10 in my last performance review. I think I communicate effectively and in a pleasant way. I get along well with most people I meet, and people find me easy to talk to, so I think I have good people skills. When I was in college, I volunteered with the alumni association to make calls for donations. I got along well with the alums I talked to and was very effective at obtaining donations. Throughout my career, I have always worked in customer service, and been known as a people person. I enjoy working with others toward a common goal. In one of my first jobs, I learned how effective it could be to work as a team when I was in a group that was handling calls on a recalled item. We were able to share our strategies and improve customer satisfaction by 30% in a 3-month period. Good people skills include the ability to relate to others, and to problem-solve. I was able to use both of these skills effectively during my internship at XYZ Company. Part of my job was to greet clients upon arrival at our offices and determine which sales associate would be the best fit for their needs. When clients have issues, I use a calm tone of voice to gently educate them about our company’s services and policies. I also know not to take their anger personally, even if they are verbally abusive. Instead, I sympathize with their position and assure them that we’ll come up with an effective solution for them. I begin our discussion with an apology – something like, “I’m sorry to hear about this issue. If you will please answer a few questions for me, I’m sure that we can resolve it to your satisfaction.” Nine times out of ten, this immediate apology serves to quickly defuse their temper so that we can work out a solution together. I use active listening strategies to gather as much information as I can from escalated customers, letting them have their say without interrupting them. Then I summarize and repeat back the details they’ve told me so that they’ll know I’ve fully understood them and am eager to assist them. I let them know from the very beginning of our conversation that they have my full attention – and I try very hard not to put them on hold, since this will only frustrate them more. If it turns out that I’ll need to research their issue with another department, I ask their permission to put them on hold, telling them that I very much appreciate their patience while I work to resolve their issue. Finally, a general question that almost always comes up in any interview is, “Why should we hire you?” Try to emphasize your people skills when answering this question. My people skills have allowed me to excel in call center work. I can empathize with my callers, and I listen carefully and try to resolve issues as simply and effectively as possible. At my last position, I received recognition for my work with customers – which made me even more excited about providing excellent customer service. Some people burn out quickly in call center customer service jobs, but I’ve been doing this successfully for five years and wouldn’t want to work in any other field. Maybe it’s just because I really enjoy talking and listening to people, but I find that it’s personally rewarding, at the end of the day, to know that I’ve actually helped people while providing a positive image of our company. You should hire me because I’m a born problem-solver – I love the intellectual challenge of figuring out how to fix issues. Part of this is being able to calmly communicate with clients to gather information about problems. Successfully resolving trouble tickets makes me as happy as when I’ve finished a Sudoku puzzle in record time. One of the things that has helped me the most in customer service is that I’m bilingual in English and Spanish. This allows me to serve a wider range of customers than call center representatives who are monolingual. In addition to possessing strong people skills, rockstar call center representatives also need soft skills such as patience, organization, effective time management, a solid work ethic, and creative thinking. 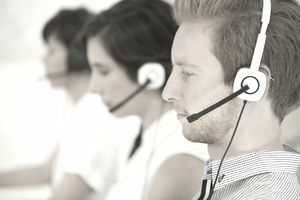 If you pride yourself on having these skills, your job outlook as a Call Center Representative is excellent: the Bureau of Labor Statistics predicts that hiring in this field will grow by 5% by 2026.